XML error message: Content is not allowed in trailing section. mas boleh sapa pake ngga temp nya buat blog saya ? Why does this not work? How can I fix the code? I get error messages. to get it to work delete the google word edit message at the very end of the script when you paste the code into your edit html section under layout. presto! try it derek, my friend. i cant use to my blog , donno how ? 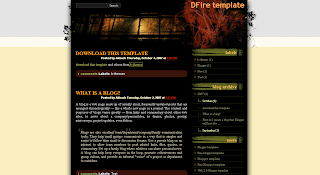 hi, i have used this template to my blog now, but then i dont find the settings tab out here, where will i find that? There isn't any settings option after i used the template. How to i fix it? I love this template, but I can't get my comments to work. Any ideas? Wooo. Trying to use this on my blog about Luck. wow finally my blog is looking wonderful. that was awesome..I appreciated ur hardwork. TQ. Thx a lot. i really like it. Thanks! I love this new look in my blog! Thanks a lot for this template, i love this template a lot. This is what i am looking for templates.I am going to install it. ok, keren abis.,.,.tapi kalau mau pke layouts itu gmana ea,.,. this dark template is particular never seen before, I have a collection with Professional Blogger Templates, all are free sure. Check them and comment, we are looking for to know what u think about. I like this but couldn't use it. Can anyone help me? Great template but a little dark for my taste. awesome template but cant seem to get the comments to work any ideas? 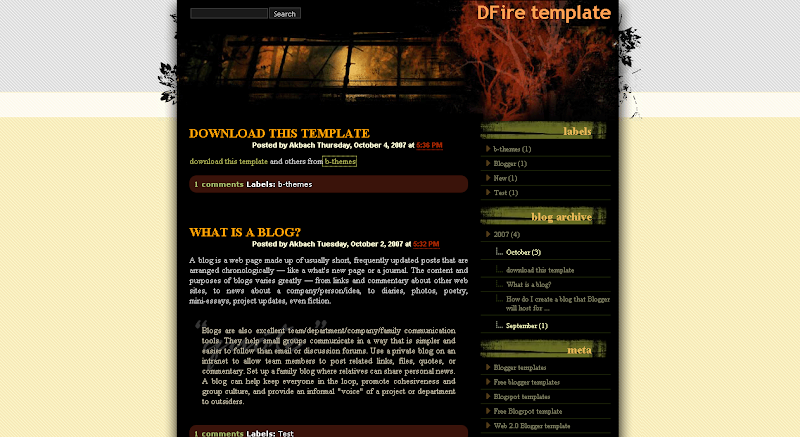 Great template, and the only one that's not on every other free blogger themes website. Good job. .is the how to make the font back of the picture. hi there. currently i am using this wonderful template. thank you for it. everything is okay with it but a small problem. Thanks for the template, its very sweet. Until I get round to making my own template. Nice templates! I Really love this templates! Thanks a lot! Two Thums Up! I've bookmarked this website! Thanks!